So, you’ve chosen the perfect cabinetry, the dream countertop, and the ideal sink for your kitchen, now comes the all-important decision, the best kitchen faucet for you and your family. How do you decide with so many choices out there. A quick online search, or a trip to the big box home improvement store can leave you feeling overwhelmed and unable to decide. To alleviate that confusion, here are the best kitchen faucets right now to help you make the decision. 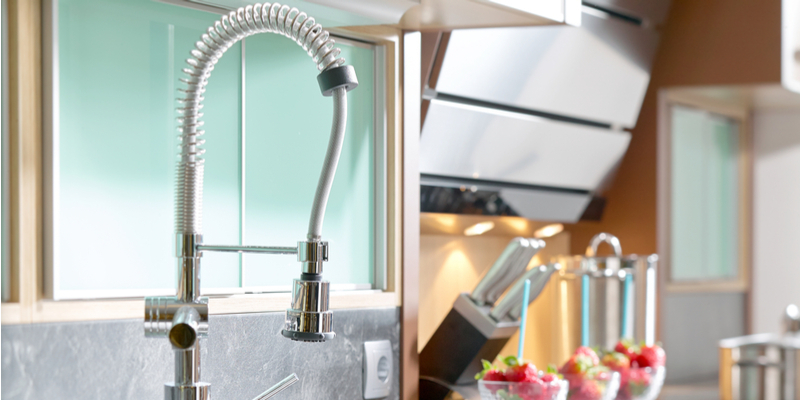 When choosing your new faucet, style and functionality come into play. In addition, you’ll want a faucet that has staying power, in other words, one that can stand up to the wear and tear which families dole out in the kitchen. Another important factor is choosing a faucet that can live up to you and your family’s lifestyle – for example do you cook a great deal, is your family unusually messy and other factors can help you decide the faucet that is best for your kitchen. When choosing any faucet for your kitchen, be sure to read reviews, note whether key parts are heavy duty metal or not so lasting plastic, and if the manufacturer offers the best in customer service. Remember, you’ll also need to choose single versus double handle style which can make all the difference in finding the perfect water temperature for the littlest hands. And keep in mind, ceramic disc valves mean smooth easy function without unwanted drips. Very stylish and offering classic function and style are the latest in pull-down faucets. Their unique design lets you pull down the faucet to help you wash dishes, oversized pots and pans, and clean up sink messes with ease. In addition, most pull downs offer a high arc design which allows for even greater function as well dual spray controls to clean all the angles. Some models even feature connected soap dispensers, inspired by professional chef kitchen designs. Pull-down faucets usually have taller arcs and shorter hoses because they are designed to pull down in one fluid downward motion into the sink for rinsing and filling. This style faucet is the perfect match for a deeper sink. Touchless faucets feature motion sensors to help you get cleaned up. After all, who wants to wipe down the faucet every time they reach for it with dirty hands? Touchless faucets continue to grow in popularity for this reason – you can wash your hands without having to wash the handles and the faucet after each use. Most touchless faucets offer high-arc designs, many with retractable pull-down heads and multiple spray controls for added convenience. The best touchless faucets not only offer hands-free motion sensor technology, but auto-off functionality. Another popular faucet right now is the pull-out faucet which to clarify is similar to the pull-down, though with shorter spouts on the spray head and longer hoses for moving in a variety of directions. These faucets are ideal for double sinks and work well in spaces which have limited room above the sink. Since pull-out faucets have a flexible spray head, most rotate 360 degrees, they tend to splash outside the intended area much less. Choosing a single handle or a double handle faucet is often a matter of personal choice. Dual handle design allows you to control hot and cold water separately while single handle models control both simultaneously. Many people prefer the single handle version saying the design makes it easier to adjust water flow and temperature. Those who prefer dual handled kitchen faucets believe the two controls give more control over water temperature.